A girl who drowned while training for a hiking expedition had pleaded with teachers to abandon the trip, an inquest has heard. 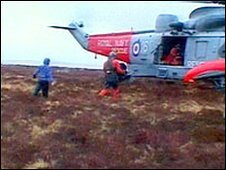 Charlotte Shaw, 14, was training for the Ten Tors on 4 March, 2007, when she fell into Walla Brook on Dartmoor and was swept away. Friend and team-mate Yasmin Moore told the coroner Charlotte felt "pushed" to continue by teacher Chris Fuller. Charlotte, from Frithelstock, died from cardiac arrest as a result of drowning. Answering questions from Devon coroner, Dr Elizabeth Earland, Yasmin Moore, now 18, said she and her team met Mr Fuller and asked to "come off" the trip on the second day of training. "Most of us were in tears. He said if we carry on, if we get through that day, we will find it easy, the real thing," she told the inquest jury. "We were really angry that we could not come off the trip." Miss Moore said most of the team was crying but Mr Fuller told them to "keep warm and carry on". When the coroner asked Miss Moore if she felt Mr Fuller was pushing them, she replied: "Yes." The inquest heard Charlotte fell into Walla Brook as she threw Miss Moore's bag across the river. Earlier in the hearing Miss Moore cried as her statement was read out to the jury by Det Con David Stribley of Devon and Cornwall Police. Miss Moore told police "she had never been so scared" when her friend fell into the water. She said that she and Charlotte, students at Edgehill College, now known as Kingsley School, in Bideford, were struggling in terrible weather conditions to find a place to cross. Miss Moore said one of the team leaders advised her to take off her rucksack which she gave to Charlotte before leaping to the other bank. "Charlotte chucked it and she fell in when she threw the bag. She just went down the river," Miss Moore said. "Charlotte said nothing - she didn't scream." Dr Elizabeth Earland told the inquest the weather "was particularly bad, it was raining, causing the rivers and streams to swell". The team used a mobile phone to raise the alarm. Charlotte was airlifted to Derriford Hospital where she was pronounced dead in the early hours of the next day. Charlotte, who was described by her uncle at her funeral as an "energetic, talented, fun-loving smiling character", had been among 85 school groups on the moor training for the Ten Tors. The weekend-long hiking expedition, which is organised by the British Army, began in 1960. A total of 26 people from three schools - including Charlotte's school, Edgehill College in Bideford - were airlifted from the moor in atrocious weather the weekend that Charlotte died. Detectives who carried out an investigation into her death ruled out criminal behaviour or negligence. However, legal representatives for Charlotte's mother, Jennifer Shaw, the Ministry of Defence, the Health and Safety Executive, Edgehill College, and two Edgehill College teachers are attending the inquest which is expected to last up to two weeks.